April 15th, 2012 08:42 PM | by William Bell | Eschatology. The definition of the rapture varies depending on which view one takes when answering the question, what is the rapture? There are three categories of rapture teaching. Each of the views are defined by their relationship to the tribulation, an alleged future event of prophecy. Pre-tribulation Rapture is defined as a seven year period occurring before the “great tribulation” in spoken of in Matthew 24:21, when saints will miraculously be swept into the heavens. Graphic representations have shown images and movies of people leaving their homes, jobs, automobiles, airplanes and machinery and even their churches while others are left behind on earth to endure the tribulation and a subsequent thousands years before the final judgment and second coming of Christ. 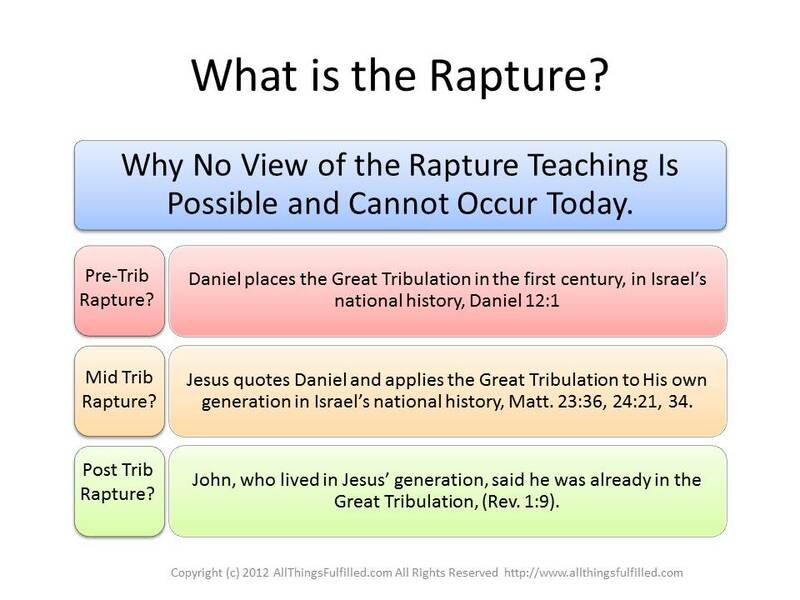 Mid Tribulation Rapture, a less popular view is the teaching that the rapture will occur after the great tribulation has begun but will commence after three and a half years. Thus, the concept of mid tribulation rapture or the middle of the tribulation period. Post Tribulation Rapture, as suggested by the name means that the rapture allegedly occurs after the seven year tribulation period . 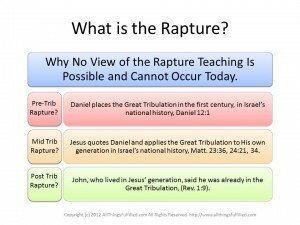 So, in defining what is the rapture, we must also define the great tribulation as it is a common starting point. What Is the Rapture Begs The Question? To answer the question of what is the rapture, it is assumed that the Bible teaches the Rapture. It is quite likely several readers may disagree. While many have labored to show that the Rapture found support in early Christian writings, it is assumed to be taught in the Bible. Original rapture teachings found their source in the Irvingites through a “prophetess,” Margaret McDonald. John Nelson Darby (1800-1882) popularized this teaching, also considered a new doctrine never taught before. Following him was the person most responsible for it’s spread in the United States, C.I. Scofield with his Scofield Reference Bible published in 1909 containing notes which many accepted as equal to the word of God. What Is the Rapture Relationship With the Great Tribulation? To begin to appreciate some of the difficulties associated with the rapture timeline, an understanding of the great tribulation greatly assists the Bible student. According to Daniel, a time of affliction would darken Israel’s national history such as had never before occurred, (Daniel 12:1). Jesus quotes this verse in one of the most controversial chapters of the Bible, (Matthew 24:21). However, he ascribes it to the historical setting of Israel, particularly Judah, during the last days of their temple era which ended in 70 AD. Jesus clearly marked the time of that great tribulation to be associated with the destruction of the temple by the Romans. In discussing the event, he sandwiched two time statements that both pointed to the first century generation in their fulfillment. In discussing the fall of the temple, he said, “Assuredly, I say to you, all these things will come upon this generation. O Jerusalem, Jerusalem, the one who kills the prophets and stones those who are sent to her!…” (Matt. 23:36-37). All dispensational rapture advocates correctly apply this verse to a first century event. After further mentioning the temple and its demise, and specifically Daniel’s prophecy of the great tribulation, Jesus again made this statement. “Assuredly, I say to you, this generation will by no means pass away till all these things take place.” (Matt. 24:34). Proof is found in John’s statement in which he affirmed he was already in the great tribulation, Revelation 1:9. The meaning and time of the texts are the same. If one occurred in 70 AD, so did the other text apply to that time. This has a great consequence for the question, “What is the Rapture?” Since the great tribulation is past and has already occurred in the first century, the idea of a pre trib rapture, mid tribulation rapture, or post trib rapture is spurious. Nothing of the sort occurred, or can occur in the light of fulfilled Bible prophecy. What is the Rapture can further be understood by listening to the recording here? Do you have questions on What is the Rapture? « What Is The Eleventh Hour Prophecy?